Dandelion is a healing weed and each part of it is edible. However, most of the plant’s health benefits are placed in its deep roots. They are a rich source of vitamins A, B, C, and D, and minerals like potassium, zinc, and iron. Moreover, these tubers contain bitter substances which aid detoxification and liver stimulation. 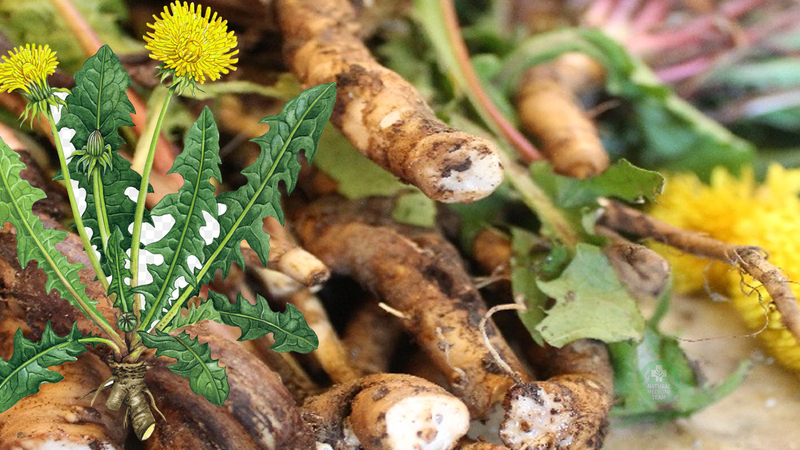 If you need dandelion roots for medicinal purposes it is best to harvest them in fall. You should know that dandelion roots grow deep and they are a little difficult to harvest. Also, the levels of the insoluble fiber inulin will be higher and fructose levels will be lower if you are harvesting in fall. If you require the roots for culinary purposes, then you should look for spring roots. They will contain less fiber, and they are less bitter and chewy. Don’t gather dandelion from busy roads and other polluted areas because dandelion is a potent detoxifier. Make sure the plants haven’t been treated with chemicals. Leave small dandelions alone and go for the largest and most vigorous plants. Be careful not to break or damage the root while you work through the moist soil with the garden fork. After you’ve released the entire root from the ground, shake it to remove excess soil. Scrub it thoroughly until clean. You’ll need to dehydrate your dandelion roots if you want to store them for future use. They can be used fresh from the ground for both culinary and medicinal purposes. To dehydrate it, use a dehydrator. Slice the cleaned roots into strips of equal size and dry them until brittle. If you don’t have a dehydrator, wrap each whole root with a long piece of string and hang in cool, dry location with good air flow. Leave them like that for several days and once dry, cut into small pieces. Store your dried root in a glass jar for up to a year. If the outer flesh of the dandelion root has a dark color and the inner flesh is creamy white, it means you’ve done a great work. Dandelion Root Infusion / Tea. This healing tea is high in antioxidants, acts as a natural diuretic and mild laxative, helps balance blood sugar, aids digestion, and more. Dandelion Root Coffee. This is a delicious caffeine-free alternative to coffee which you can combine it with roasted chicory root and cinnamon. Dandelion Root Tincture. It is used for its anti-inflammatory properties. Moreover, it is a fantastic diuretic, blood cleanser and natural detoxifier for the liver.